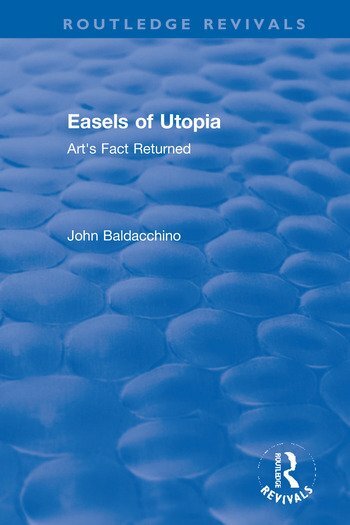 Originally published in 1998, Easels of Utopia presents a discussion of art's duration and contingency within the avant garde's aesthetic parameters, which throughout this century have constructed, influenced, and informed our definitions of modernity. In this context the book reads Umberto Boccioni's Futurism as reminiscent of Thomist realism; proposes Caravaggism's historical relevance to the election of individuality in post-war realism; and draws the readers attention to the aesthetic implications in Carlo Carrà's metaphysical art and its reappraisal of the early Renaissance. Following a contextual analysis of the historic avant-garde in Part One, Part Two presents parallel discussions of Italian and British questions, articulated by the works of Marino Marini, Francis Bacon, Renato Guttuso and Stanley Spencer in their return to individuality within art's aesthetic construct. The author argues that this initiates a return to 'lost' beginnings where form seeks knowledge, content regains an ability to anarchize, and art recognizes its contingent condition.